Water politics and Middle East: a growing conflict? “The real wild card for political and social unrest in the Middle East over the next 20 years is not war, terrorism, or revolution—it is water. Conventional security threats dominate public debate and government thinking, but water is the true game-changer in Middle Eastern politics”. This is the initial paragraph that opens the new report from the Center for Strategic and International Studies entitled Clear Gold: Water as a Strategic Resource in the Middle East. Middle East is a water-scarce region. Of the 15 most water-poor countries in the world, 10 are in the Middle East.An additional five Middle Eastern countries are well below the United Nations water “poverty line” of 1,000 cubic meters per person per year, and two others barely surpass it. On a world map of water scarcity, the Middle East is the largest region in which water demand outstrips supply. “Despite an extensive ‘water wars’ literature that blossomed in the late 1980s and early 1990s, the fact remains that few states in the Middle East have fought each other over water. States tend to cooperate over water, as Israel and Jordan did in their 1994 agreement over the Jordan River,5 and countries such as Turkey, Syria, and Iraq have kept their water tensions manageable”. “Through diplomacy, land can be won or lost, but it is through politics that power is mediated”. The report stresses how people and governments of the region have used for more than a century the finite water supplies as a political coin. Regarding the regulatory part of water use, such as empowering strong water ministries to allocate scarce resources, often has been neglected. Authors show how water ministries tend to control only a fraction of the water use, have, in many cases, little influence over or communication with related ministries and have limited access to the highest levels of political power. Generally they are weak players in governmental affairs. And too often, they and the governments serve merely respond rather than plan. The Middle East is now home to 60 percent of the world’s entire desalination capacity—with Saudi Arabia and the United Arab Emirates (UAE) alone accounting for about half that amount. What for? Because they need to supply the growing municipal water systems comino from increasing urban populations during the twentieth century. Each of these two countries continues to spend over $3 billion on desalination every year. 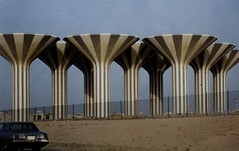 In Saudi Arabia, more than half of the country’s domestic oil consumption is devoted to the linked processes of desalination and electricity generation, and demand for both is growing sharply. Middle East also experienced a “green revolution”, beginning in the 70s and reaching its peak in 80s and 90s. 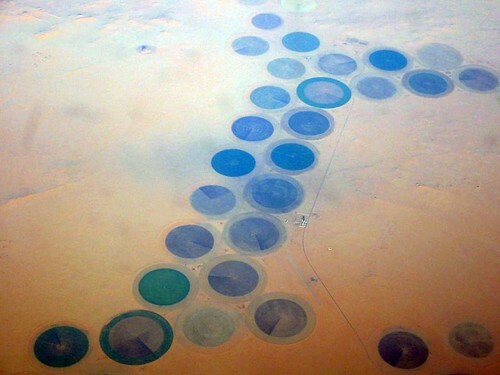 Thus, through intensive irrigation, Saudi Arabia roughly tripled its area of farmland between 1980 and 1992 and more than quadrupled its food production. Between 1984 and 2000. A total investment of $83.6 billion was spent on agricultural development, helping to become the world’s sixth largest exporter of wheat. This is a unique case in the Middle East but definitely this investment’s growth in agriculture is not (Jordan revenues from vegetables increased ten-fold during the 1980s and 1990s). Today the consequences of the Middle East’s green revolution is that between 65-90 percent of national water consumption is being used in agriculture which represents a very small portion of the whole economy. · Water as an strategy: Governments in the Middle East count water provision among their strategies for building political stability and bolstering legitimacy. Governments in the region provide cheap goods and services (food, water, fuel, and electricity) in exchange for political support. · Reward to royalties: Water and agriculture are tools for rewarding the loyalty to influential figures, and for ensuring that their royalty can endure fluctuations in the country’s political and economic trajectories. · In poor countries tied to livelihoods: Where national governments are weaker, as in Yemen, water remains tied to how people earn livelihoods in the absence of government efforts at development. · Social unrest: Water’s role in prompting unrest has so far been relatively limited, but that record is unlikely to hold. · Water as a distinctive commodity: Water remains a more problematic commodity than food and fuel: though cheap in its natural state, it is expensive to process and expensive to transport, especially in the quantities necessary for agriculture. · Mass migration: One of the immediate consequences of water scarcity will be the movement of large segments of Middle Eastern populations. In some countries migration will occur from rural to urban areas, like in Jordan. · Water refugees: Water refugees are more difficult to handle than other kind of refugees (like war refugees) since in this case responsibility for their condition would lie solely with the national government, without outsiders. · Protests on welfare: Major water loss would cast citizens into unfamiliar geographic and social contexts, and make them feel they have no choice but to emerge from quiet acquiescence in government policies and to participate in protesting the threat to their welfare. · Ethnic tensions: Groundwater’s disappearance will exacerbate tensions among ethnic or national groups with particular claims to water and its benefits. · Expectations on government’s services: Water loss could defy popular expectations of the services governments are supposed to provide, as well as the quantity and quality of those services. · Key to win supports: Governments avoid regulating water use to win the support of important groups and individuals, but as countries use up their groundwater this calculation could end up causing instability rather than preventing it. One of the report’s last thoughts is that drought is a meteorological phenomenon, brought on by weather patterns and climate change. With global warming intensifying, these weather conditions may change over time, affecting the likelihood and the severity of the droughts, provoking the temptation from governments to point fingers and responsibility away from themselves. But, under a groundwater loss scenario, the loss is often permanent, and government policies play a central role. In these circumstances, it may be harder to prevent social discontent from emerging within societies and regimes alike. In this context, governments will no longer be able to look in another direction.